An Innovative System For Smooth And Elegant Writing. The development of the SCHMIDT capless system proved one more time our strive for innovation. With creativity and technical skill we are consistently giving new impulses on the writing instruments' market. 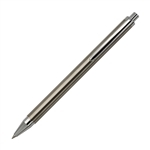 The SCHMIDT Capless Rollerball Pen is available with either a stainless-steel barrel and chrome-plated fittings or aluminum bodies with chrome-plated fittings. The aluminum option pens are anodized and available in red, green, blue silver and matt black color. 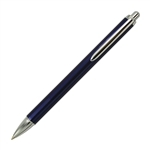 The SCHMIDT Capless Rollerball Pen is an innovative system for smooth and elegant writing. This system combines the individual writing characteristics of a fountain pen with the convenience of a rollerball pen. You don't need a protection cap for this any more. While the ink is drying quickly on the paper, it does not so within the refill itself - for more than one year! Enjoy writing with the SCHMIDT Capless writing instruments – the incredibly smooth writing feeling of the SCHMIDT Capless refills and the clear, elegant lines make writing a great experience. The Capless System combines the unique and individual character of writing a fountain pen with the convenience of a rollerball pen. This is a great first rollernall pen for just about anyone-whether it’s a back-to-school gift for a student, or an inexpensive everyday writing to start your own collection.